Is the Price Drop in Oil All Good? The short answer to that question is no. There is some downside to falling oil prices. But I’d take a 90-percent upside with a 10-percent downside any day of the week. Much of the commentary on the price drop in oil, including mine, has focused on the benefits to consumers in the form of lower gas prices, which creates income that can be spent on other things, to the economy’s advantage. Recently, though, the narrative has turned to the costs of lower prices, such as lower capital investment, lower profits in the energy industry, and the potential for job losses. All of these threats are real and worth paying attention to. In the big picture, though, they don’t even come close to offsetting the benefits of lower oil prices. 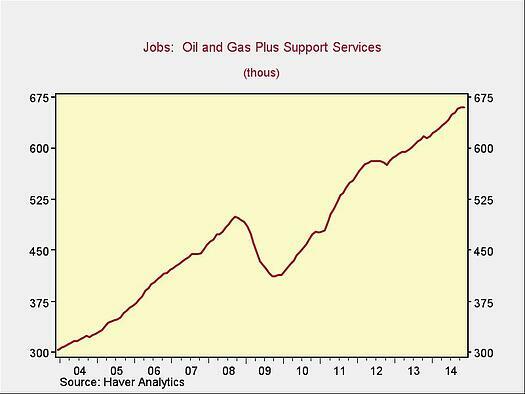 First, let’s look at job growth in the oil and gas sector over the past 10 years. Note that this is the actual number of jobs, and it probably overstates the total slightly since I included all mining support jobs, not just those associated with oil and gas. Since 2010, about 300,000 jobs have been created, at best, which is not too shabby. We would be in much worse shape without those jobs, no doubt about it, especially since many of them came in the early years of the recovery. Over the same time period, however, the economy as a whole created about 10 million jobs, so the 300,000 jobs in oil and gas represent only about 3 percent of the total. This is an important contribution, but a decline in the job growth rate for that sector would not be catastrophic. Similarly, the damage to companies investing in drilling, while potentially real and material, wouldn’t be a disaster. Industrial equipment investment as a whole has contributed, historically, between 0.2 percent and 0.4 percent to economic growth. If we average that, at around 0.2 percent, and allocate half (which seems high) to oil and gas drilling, we get around a 0.1-percent potential hit to economic growth. If we include other, ancillary investment, we can double that, for a potential hit of around 0.2 percent. With growth running between 2 percent and 4 percent, that’s worth paying attention to but not losing sleep over. So, the damage could be around 1 percent or 2 percent of employment growth and around 0.1 percent of economic growth. 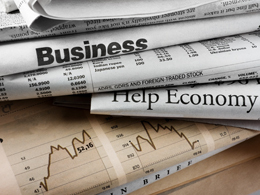 The upside, in the form of lower costs for consumers and businesses, could be immense. One common rule of thumb, per the Wall Street Journal, is that a $5 change in the price of oil results in a 0.1-percent change in economic growth. With oil prices down almost $30 over the past quarter, that would suggest a gain in economic growth of 0.6 percent—well above the costs incurred by slowing investment in the sector. Overall, the drop in oil prices is an almost unmitigated win for the U.S. and for other countries that import substantial amounts of energy. For countries that export oil and whose government budgets depend on oil revenues, the reverse is true. We’ll talk about that tomorrow.